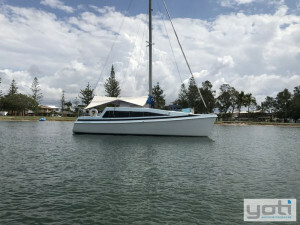 Ocelot is an '86 Crowther Sport 10 catamaran now listed exclusively for sale with YOTI Multihull at the Boatworks, Coomera, Queensland. 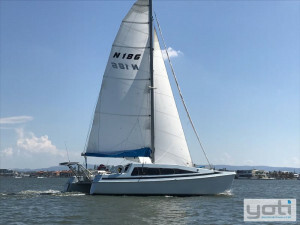 Build by Beach Marine in Narrabeen, she was designed to be a large liveaboard family cruising catamaran in the open bridge deck configuration for extended cruising and club racing. She will generally outperform similar vessels with full bridge deck configurations. 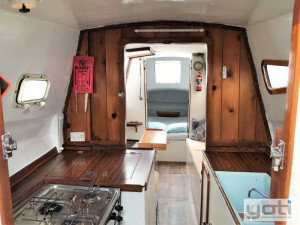 The current owner, a marine electrician, has completed updated this vessel in 2014/ 15 and has kept her in a great condition for his coastal adventures. Please see the inventory with renewal dates of all major equipment! 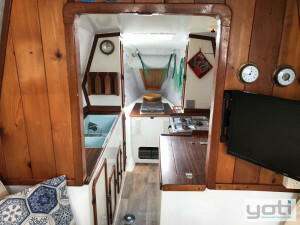 The vessel has large deck areas for relaxed outdoor living and entertainment and would also make an excellent dive and fishing platform. A full deck sun awning transforms this area in a very large, cool, vented living space. A practical custom arch, across the aft deck, makes great seating at anchor or underway, whilst also protecting the steering link bar. The centrally mounted recessed and protected cockpit has bulkhead mounted steering and seating around the cockpit table. 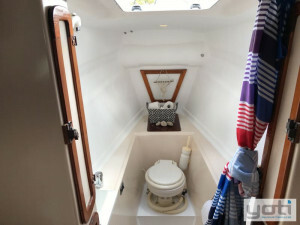 A cockpit bimini gives sun protection whilst sailing. 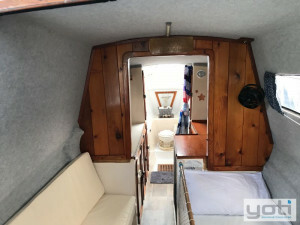 The comfortable living space inside the hulls catches everybody by surprise: the port hull has a Queen Berth aft (tapered towards the stern) with full height hanging cupboards and under berth storage. 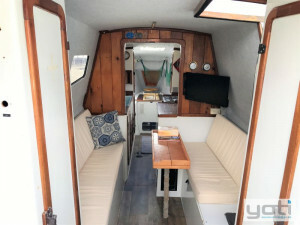 Midships is the dining table with ample seating to host a party! 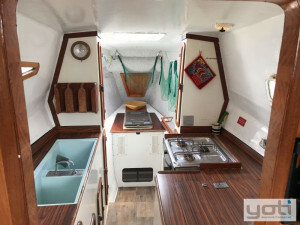 Further forward is the serious galley with double sink and 3 burner gas stove/ oven, massive top opening 160 ltr fridge and storage cupboards. 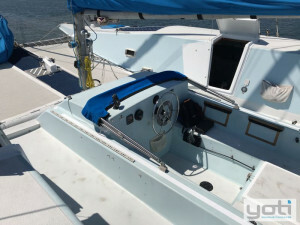 In the bow are additional storage and a 40 ltr top opening freezer. 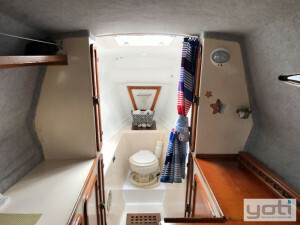 The starboard hull also has a Queen Berth aft, again with full height hanging cupboards and under berth storage. 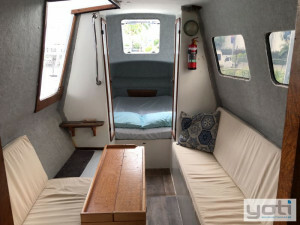 Going forward is a single berth across from the companionway and a settee on the inboard side. 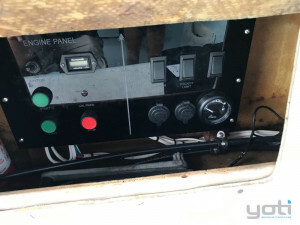 Further forward is the navigation desk, electrical panel, more storage and a large head in the bow. The head has a hot and cold water shower and electric toilet. 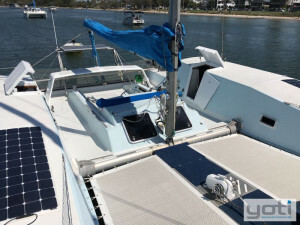 The whole vessel is run of the 650 Watt Solar Panels, which under normal conditions even allows for heating of shower water by the 10 ltr 12 volt hot water boiler. 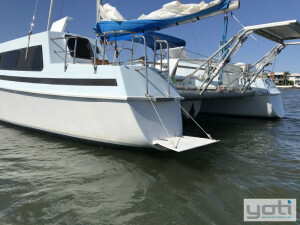 The vessel is normally totally self sufficient but can also be plugged into shore power. 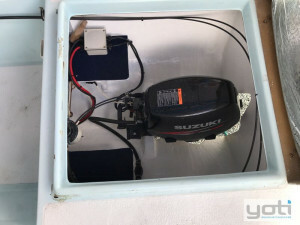 The centrally mounted Suzuki 15 hp 4 stroke outboard is very economical and will propel the vessel at 5.5 -6 kts at 2 ltrs /hr. 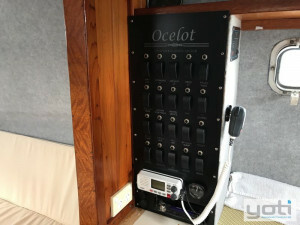 The outboard has an electric start and is tilted up during sailing to reduce drag. 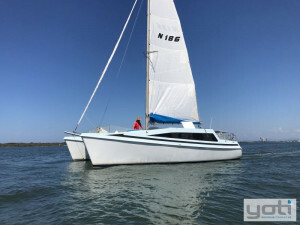 The single spreader fractional rig can be rotated to enhance her sailing performance, and "Ocelot" comes with Doyle sails from 2015 in great condition. 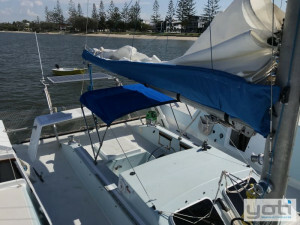 She also has a Screecher on an endless line furler, for lighter wind conditions. 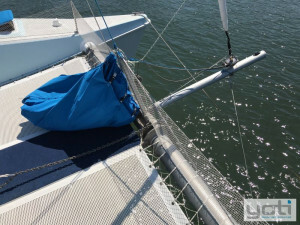 Her standing rigging was replaced in 2014 and the mast was removed in 2018 by riggers for a full service. The rudders are linked by a bar with hydraulic wheel steering from the central cockpit. 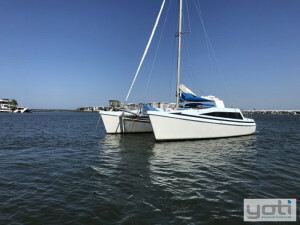 The vessel has a great Raymarine autopilot for passages or shorthanded sailing. 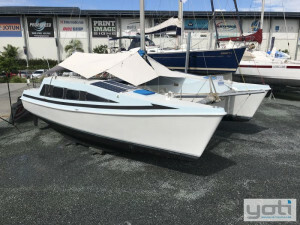 This is a great "turn key" catamaran, that really needs to be seen to be appreciated. 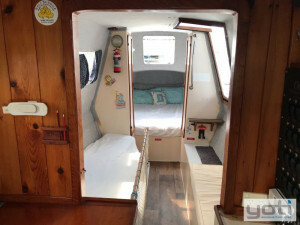 Her interior and deck space will surprise you for a vessel this size; a great and economic cruising cat for coastal cruising and living aboard. 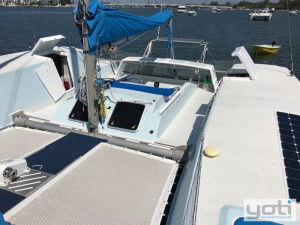 Please contact Robert Vrind at 0428 47 22 31 for further details on this well presented vessel and to arrange an inspection at the Boatworks, Coomera, QLD.